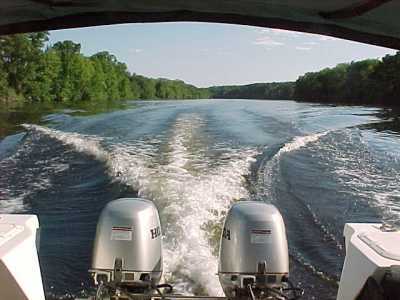 -----We came into Lake Champlain by traveling up the Hudson River from the launch ramp at Kingston. The journey north up the upper Hudson and through the Lake Champlain Canal is a delight, and a definite plus to a cruise on Lake Champlain. -----We later came into the Lake from Quebec, via the St. Lawrence River and the Chambly Canal. This is another scenic and pleasant entrance to the lake. 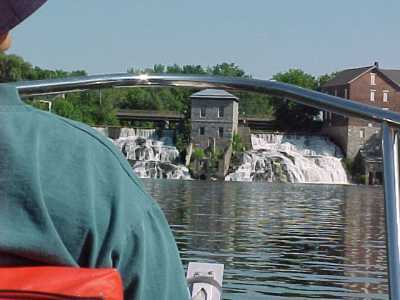 The routes to the lake are marvelous and we would encourage cruisers to add both to their Lake Champlain cruise. -----There is a marvelous welcome to tired cruisers when you leave the last lock going northerly in the Champlain Canal - the Finch and Chubb! 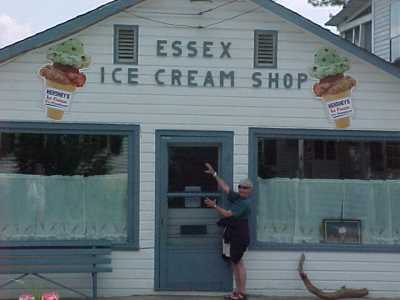 A gourmet restaurant, recommended by Donna and Peter, Hudson River C-Dory folks. -----"See?" I stated smugly. "New England doesn't have a monopoly on good eating!" Now, that was waving a red flag in the face of my Yankee spouse. -----"And just how far do you think we are from Vermont?" she replied. Hard to get one up on El. 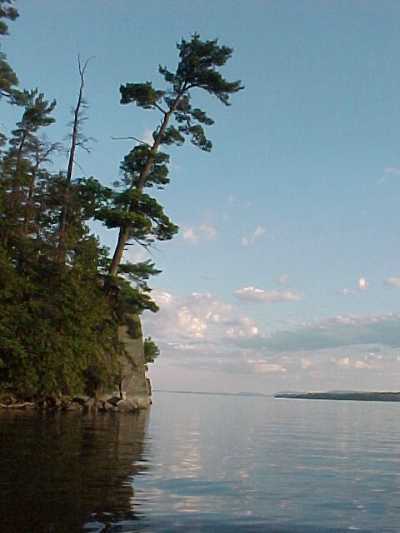 -----The southern extension of Lake Champlain is more akin to a river than a lake. We anchored in a weedy cove next to the railroad track. Soon, every engineer knew El. She always waves to "the front end." Must be a Yankee tradition, or something. Every passing train would 'hoot' a response. The next morning, when she wasn't even in the cockpit, the northbound freight woke up all the surrounding farmers with his frantic 'hooting' until El appeared and gave him a wave. There was a happy 'toot toot' in response. So, if you anchor your C-Dory near the route of The Adirondack, and every train shakes the hills with its klaxon, you'll know why. -----We hung on the hook late into the rainy morning, chatting. We have been married over forty years, and for the past fifteen, since we quit our jobs, have rarely been more than ten feet apart. And, we still get talking on into the mornings. Some days, we never leave the hook. Come to think of it, that's how we met - over late night coffee, talking on into the night together. -----We had lots of company in our weedy cove. Fishermen were everywhere. "Must be good fishing here," I opined. "Everyone has a big smile on their face." -----"Have you seen anyone catching anything?" El asked. -----"Well, come to think of it, no." -----"You don't understand fishermen, Bill. The reason for the smiles has nothing to do with fish. Look - every one of them has a beer in their hands." And she was right - they did. -----El has another hypothesis that so far has stood the test. Let's see what you think. -----"People who have good taste in one matter, have good taste in most others," she states emphatically. "Notice," she says. "Folks in good restaurants have good taste in clothes. Not necessarily expensive or 'trendy,' but tasteful." I think about her observation and find it generally true. -----"Look at the car a person drives, and you already know much about the personality. Or, check out their shoes - or, their hat, if they wear one." We have made many observations, and, you know, I think she is right. "You can't judge how deep are the pockets by the expensiveness of the clothes," she continues. "Some of the wealthiest folks I knew as a kid, never 'wore' their wealth. Only the ones new to affluence, or deep in debt, wear fancy clothes. The rich folk wear comfortable, well-made clothes - you know, tasteful." -----"Yep," I said, pondering her words. "A college friend of mine sported worn moccasins, faded Levis, and a slouch hat - and there were two dorms on the campus named for his father and grandfather." -----"It's the same with C-Dory's - they aren't ostentatious or glitzy, just plain quality and good looks," she said with a serious look on her face. "So, folks who own them have good taste in boats and know value when they see it." I know her facial expressions well - she never can hide an emotion - and I could see 'conclusion' written there. -----"That's why C-Dory owners can always steer us to such good restaurants," she finished. 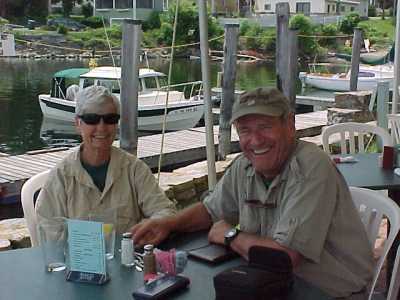 -----We had lunch that day at the Basin Harbor Hotel, recommended by Donna and Peter - and El's conclusion proved correct again. If you stop there, Sunday brunch is outstanding, with just the right sauce on the eggs benedict. After brunch, walk over to the nearby Maritime Museum - it's excellent. Oh, and say 'hi' to Chuck, the harbormaster at Basin Harbor, for us. 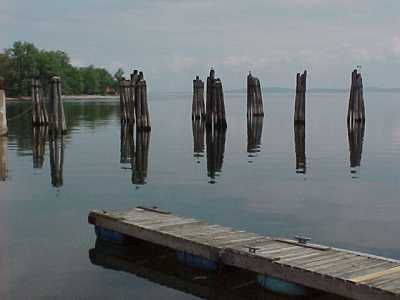 -----The waters of Lake Champlain are steeped in history. Native Americans have lived on the shores and fished the waters for millennia. The early history of European settlement, and conflict, on this continent is etched into this water route between the St. Lawrence and the Hudson. Generations of my folks, settlers of the Hudson, traveled and fought along this water highway. 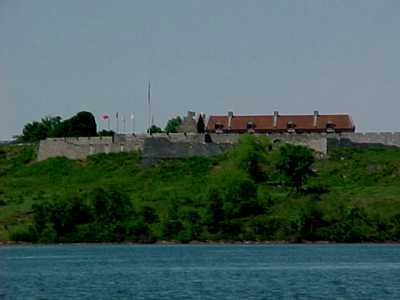 -----Forts guarded the southern end of Champlain. During the French and Indian War 3,500 French were holed up in a fort resisting a force of 15,000 British and Americans. For reasons known only to himself, the British commander James Abercromby decided not to use his numerous cannon against the defense of the fort. Instead, he used frontal attacks by men armed only with muskets. British losses were enormous. Eventually, the French blew up the fort and retreated. -----Seventeen years later, in 1777, my ancestor, a member of New York's 1st Ulster Militia, bivouacked outside the fort. His unit was en route to a disastrous invasion of Canada, in which 'calamity followed calamity.' My family has preserved the story of his encampment: "We arrived at the decaying remnants of the fort on a dark and rainy afternoon. The area was infinitely dispiriting. Truly, this must have been the last part of the world that God made - and he must have made it in the dark. Our encampment was ancient Golgotha - the place of skulls. They were so numerous that our soldiers, for want of other vessels, drank from them. Our tent pins that horrific night were the shin and thigh bones of Abercromby's men." 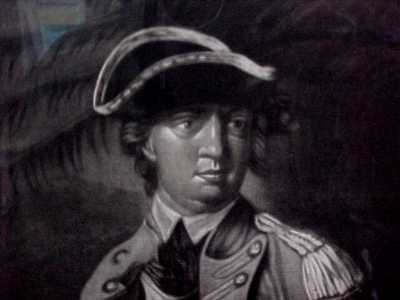 -----Benedict Arnold is remembered as a traitor to the American cause. In the tales told by my family, however, he is a hero. If it were not for Benedict Arnold, perhaps I would not be here. 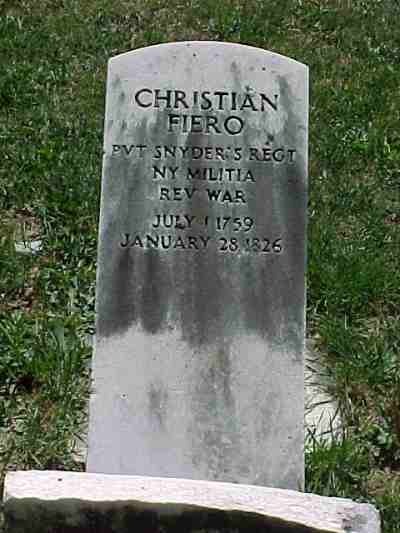 -----In the fall of 1776, my ancestor, Christian Fiero, hunkered in the cold air of approaching winter behind the walls of Fort Ticonderoga. To the north, the British, commanded by Sir Guy Carleton, were massing an army and an armada of warships. Between Carleton and Christian, was Benedict Arnold. He was commandeering transport ships and modifying them for cannon. He frantically pressed Vermont farmers into constructing yet more. Hearing that Arnold was gathering a fleet to oppose him, Carleton delayed while he assembled a fleet of over two hundred bateaus. 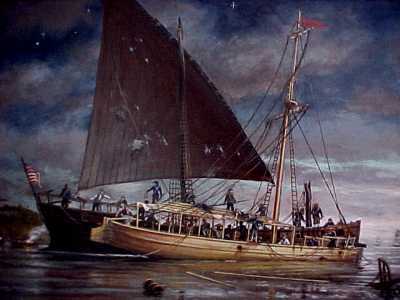 He even had a square-rigged three-master hauled from the St. Lawrence River, around the rapids of the Richelieu, and re-assembled on Champlain. Fatefully, this work delayed Carleton for weeks, into mid-October. -----Arnold received confused orders. He was told to attack St. John's, only 28 miles from Montreal, and north of the British army! He was also ordered not to engage the superior force of the British navy. Impossible. Fortunately, for both the Patriot cause and Christian, Arnold was an independent thinker and a brave man. -----In defiance of orders, he circled his "gunboats," bow to stern, in a half circle in a cove on the west side of Valcour Island. His "fleet" stood defiant - blocking the southerly path of the advancing British Ships of the Line. Just one of Carleton's ships, the Inflexible, was so heavily gunned that it, alone, could have destroyed Arnold's "navy." 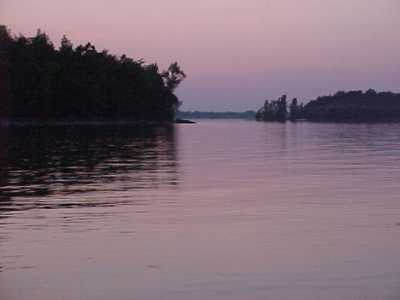 -----El and I sat anchored in Halcyon, in that same little cove of Valcour Island, reading the account of the battle. We could see that Arnold had chosen well - the channel was so narrow between the island and mainland that British ships could only attack his vessels one at a time! Furthermore, they would be beating into the northerlies, an almost impossible feat for square-rigged vessels. His little fleet might have a slim chance. -----The British attacked. At the end of the day, the American flag still flew in the cove. After the tremendous fusillades, two British boats were out of commission and several British commanders were incapacitated. The American fleet, however, was decimated. Many Patriots were killed and wounded. -----Sunset revealed the British fleet anchored across the channel below the island. Arnold and his officers met after darkness on his flagship, Congress. 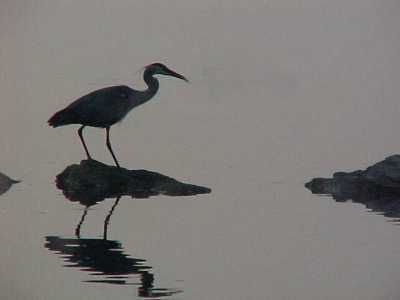 A mist was slowly rising from the waters of the lake. -----Their defiance that day had succeeded! They had delayed the British. Now, their only option was escape. If they remained, they would be destroyed the next day. They couldn't sail north up the channel against the wind. Arnold boldly suggested they row and sail their remaining boats to the south under the cover of the mist -- through the anchored British fleet! That Friday night a single file line of fourteen American ships silently moved south through the fog and darkness. Not one British sentry saw or heard them. -----Carleton was furious the next morning to find the Americans gone. The heavy fog further delayed him. Finally, the British lifted anchors, hoisted canvas, and sailed south in pursuit. Nature now sided with the British. The wind shifted. ----------The Americans, well to the south of the British, were the first affected by the wind shift - southerly! Our fleet was halted directly in front of the enemy who continued to enjoy the northeasterly wind. The Americans pulled their ships by rowboats, into the wind. It was unbelievable to the Americans - the British fleet seemed to be sailing directly into the head of the wind and they were closing on the American vessels. -----When catastrophe appeared certain, the wind shifted again, giving the Americans the northeasterly. Quickly the rowboats were stowed and sails were set. Even so, their progress was painfully slow and the British fleet, better rigged, continued to close. -----It was soon over. The British warships captured or destroyed most of the American ships. Only four gondolas and Arnold's ship, Congress, were left. Three British men-o-war closed on Congress. She stood alone and fought the three British ships allowing the gondolas to escape. Congress was hulled twelve times and two iron balls brought down the main mast and rigging. 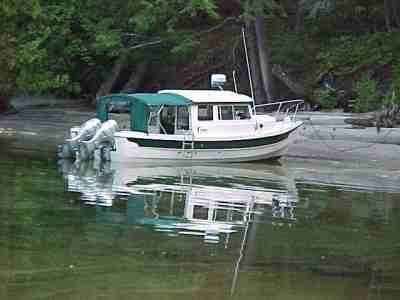 Arnold sailed her under jury rig into a small bay on the eastern shore of the lake. He and his men took all the small arms and cannons ashore and then set fire to their ship. They watched in silence as flames made their way up the remaining rigging and to the flag. Then, as British ships entered the Bay, they fled south overland to the American lines. -----Arnold lost the battle but won the field. The British, already delayed, now received the whims of weather. For twenty days, gales stalled the fleet. When they finally reached the Lake Champlain narrows and the American fort, my ancestor Christian and the other 12,000 American troops were at the ready. Judiciously, Carleton judged it too late in the year to besiege the well-defended fort. -----The American lookouts saw the British fleet turn and tack northward back to Canada. Christian Fiero, and most of the Patriots, returned safely to their homes for the winter. 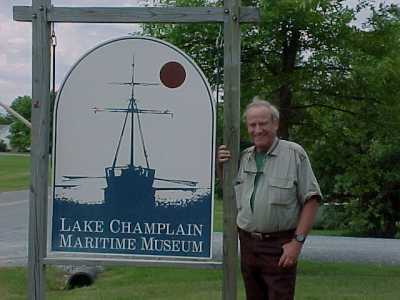 Champlain was still an American lake. Arnold's makeshift navy had gained the critical year for American Patriots. Perhaps this action saved the Revolution. 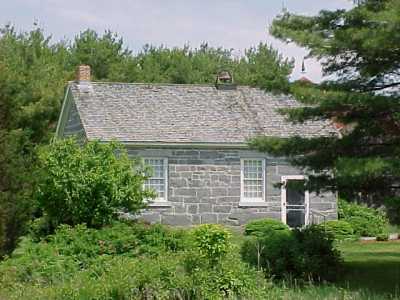 -----We were snug against Valcour Island, spring birds singing their evening songs from the forest around us. We sat in the cockpit reading history. The sun slowly set, and just like that fateful night 225 years earlier, a mist began to rise out of the water. -----A few days later, NOAA predicted afternoon thunderstorms. We decided to head up Otter Creek where we would have protection if wind picked up. We meandered up seven miles of creek through beautiful weather. However, thanks to the meteorological mistake, we got to see the town of Vergennes. 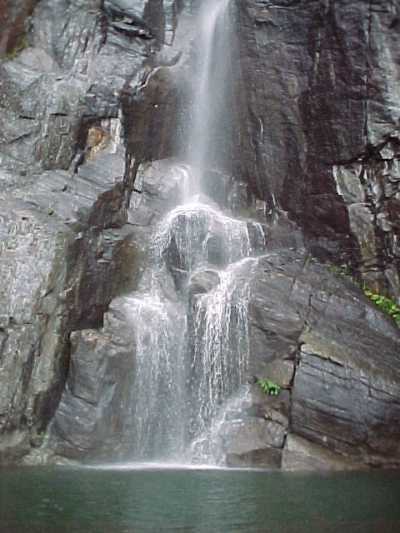 A big waterfall powered sawmills in the early days. Here, McDonough, in the early 19th century, built wooden ships for the US Navy. These ships defeated the British, in the War of 1812, at the Battle of Plattsburg. They won Lake Champlain for America - again. -----We spotted another C-Dory. We made a U-turn and met Ed and his Rambler, anchored in a cove sheltering from predicted high winds. We compared notes from his solo cruise from St. Louis to Lake Champlain, via the Mississippi, Gulf, and Atlantic coasts. 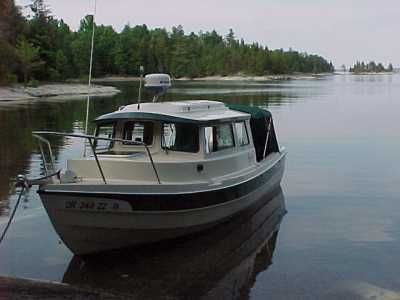 -----Our three weeks on Lake Champlain were a delight. The pleasant towns (don't miss North Hero), lovely anchorages, great scenery, and historic locations make this first-class cruising water. -----Reluctantly, we turned to the south'ard toward the canal and the Hudson. But, not before stopping again at the Basin Harbor Hotel and the Finch and Chubb - life is too short to pass by a good meal.